I had good plans for my quilting this week. But instead, Winter 2015 has demanded my attentions. With over 100 inches of snow in Boston in the past 4 week I'm spending a lot of time dealing with the demands of mounds of snow on the ground and ice and snow on the roof. Lots of time outside, very little time working on quilts! Yesterday I did grab a hour to sandwich my Bonnie Hunter Winter 2014 "Grand Illusion" Mystery Quilt. Whew! I was so glad to get that done before I went back outside. Layering and basting quilts is so much easier since I discovered Pat Merkle's Board Basting method. She blogs at www.colormequilty.blogspot.com. Pat's board basting technique is pure genius. All you need is a long table (I use my dining room table with 2 large cutting mats on it) and two 1" x 3" x 72" boards from your local home improvement store. (If you have a choice of lumber, purchase the better quality boards. They should be straighter with smoother cuts which means less likely to splinter). With board basting, I can put a queen size quilt together in a about an hour. The layers are always flat and wrinkle free. I have said good-bye to the volatile basting sprays that I used to use. That's good for the environment, my lungs and the fabric in the quilts. Check out Board Basting at the link above! Winter has won a few rounds in our battles this month. Yesterday a friend asked for a mitten pattern. When I ran upstairs to the printer I heard "rain" in my sewing room. What?? Water was dripping from the molding of my craft closet. Grrr. That was a very low blow from Winter. My craft closet of all things!! I was able to contain source of the leak in the attic and there was no damage to the items in the closet. Whew. It could have been a lot worse. My craft closet is back to back with a linen closet where I keep my seasonal quilts, I pulled them out and tossed them on my bed which is in another room. 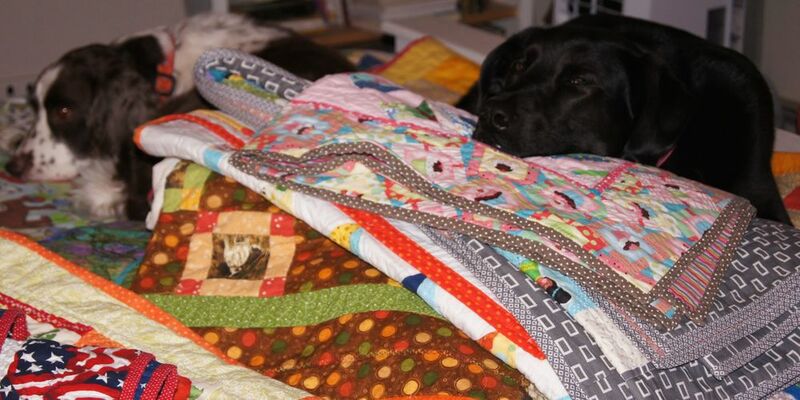 I didn't think any more about those quilts until bedtime. I discovered they were all under the watchful care of Hazel and Tipper!